INTRODUCTION Please read thoroughly before playing. ACCESS welcomes you to the exciting world of professional golf with LEADERBOARD EXECUTIVE EDITION. The most realistic golf game ever developed for the home computer because it gives you a true perspective view of each golf shot you take. LEADERBOARD EXECUTIVE EDITION is a game of concentration, co-ordination and control. You will need to judge distance accurately in choosing your club and power of your swing. With practice, you will soon be playing LEADERBOARD EXECUTIVE EDITION like a touring professional. OBJECT OF THE GAME is to sink the ball into each hole by hitting the ball with a club the least number of times possible. Avoid hazards that add extra "strokes" (hits with the club) to your score. Low score wins. LOADING INSTRUCTIONS (Cassette) (1) Plug a joystick into port # 2. (Rear port). (2) Turn on the monitor and computer. (3) Insert the rewound cassette into the cassette drive, while holding the SHIFT key, press RUN/STOP, then press the PLAY button. After the computer responds with FOUND EXECUTIVE, press the COMMODORE key. (4) YOU MUST LEAVE THE PLAY, FAST FORWARD OR REWIND BUTTON DOWN WHILE PLAYING. (The fast forward key is recommended). You may remove the tape if you wish, but this must be done while in the `Select Number of Players' screen. At any other point, one of the above buttons must be down or the game will not operate. If you want to play course A proceed as normal. If you choose course B, press SHIFT and RETURN together and the screen will go blank. Insert cassette side 2, rewind and press PLAY. The screen will remain blank while the course is loading. Once loaded you will return to the options screen. If after completing course B you wish to play course A again, at the options screen, press SHIFT and RETURN together. Course A is re-recorded after course B on side 2 of the cassette. Rewind cassette if, after playing course A for the second time, you wish to play course B again. (2) Plug a joystick into joystick port # 2 (Rear Port). (3) Turn on the disk drive, monitor and the computer. (4) Type LOAD "*",8,1 and press return. (5) First you will see the title screen and then a few moments later you'll see the `Select Player' screen. If you wish to play course B insert disk side 2 and press SHIFT and RETURN key together and the `Select Player' screen will appear. If after playing course B you wish to play course A, re-insert side 1 and press SHIFT and RETURN at the `Select Player' Screen. press 1, 2, 3 or 4. Type in the name for the 1st player (up to 8 characters) and press [RETURN]. Now select the ability level for the 1st player. Each player can compete under conditions that match his or her level of ability and experience. Press [N] for NOVICE, [A] for AMATEUR, or [P] for PROFESSIONAL. Below is a description of each level. Novice - Beginner Level - When a shot is taken on this level, it will not hook or slice or be affected by the wind. Amateur - Intermediate Level - Shots at this level will not be affected by the wind. Professional - Advanced Level - No restrictions on wind or hook and slice. After entering the NAME and ABILITY for the 1st player, do the same for each of the other players. Club selection is made by moving the joystick up or down. The following table lists the range of each golb club. (*) The computer automatically selects the putter for you when you are playing on the green (within 64 feet of the hole). This is the only club you can use on the green. Use the cursor to aim the direction of the flight of the ball. The cursor is locate several yards in front of the golfer. To control the cursor, move the joystick right or left. If you are playing on the professtional level be sure to check for wind effect. (Professional Level Only). Wind can have a substantial effect on your golf shot. To control its effect, you need to learn to read the wind indicator on the right side of the screen. White - The white stake indicates wind velocity. If this marker is tall, the wind velocity could have a substanctial effect on your shot. The shorter the white stake, the less the wind will be a factor. Blue - The blue line indicates the direction the wind is blowing. The line acts as a streamer. If the lines are toward you, the wind is blowing toward you. Once you have elected your club and positioned the cursor to aim your shot, there are only three more things to do before the ball is on its way; start the swing, set the power, and snap your wrists to control hook or slice. All three are accomplished during the swing sequence and require careful timing and concentration. The sequence can be viewed by watching the golfer or the power/snap indicator. Step 1: Start the swing holding down the button. Step 2: Set the power by releasing the button during the backswing. Power is at maximum only at the top of the backswing. Releasing the button at the top will set maximum power. Releasing the button just before or just after the top will reduce the power slightly. Releasing the button well before or after the top will reduce the power. The amount of power available during backswing is shown of the upper left portion of the power/snap indicator. When the button is released, the setting you have chosen will be locked on the indicator. Step 3: Set the snap by pressing the button at or near contact with the bell. Snapping just as the club hits the ball (or at the Tee Bar on the snap indicator) will produce a straight hit. Snapping too soon will cause the ball to "hook" (go left). Snapping too late will cause the ball to "slice" (go right). When the button is pressed, the point of the snap will be locked on the indicator. The swing sequence then is: Start - Power - Snap or Button - Release - Button. The best way to learn to hit the ball straight consistently is to practice on the driving range. Once you get within 64 feet of the hile the computer will automatically place you on the green and remove the pin (the pole with the flag). You cannot change clubs at this point since the putter is the only club you can use on the green. To putt the ball, you need to do only two things; aim your shot and set the power. Use the cursor as before to aim the shoot. The ball will start out in this direction. The ball may break left or right depending on the slope of the green. 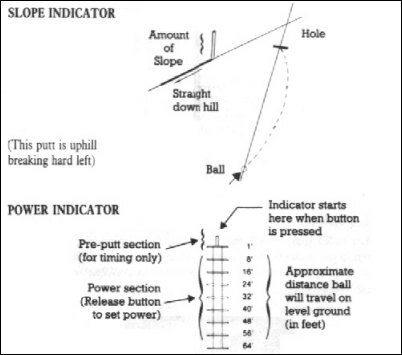 To determine the amount and direction of break, you must learn to read the slope indicator which appears on the green to the left of the golfer. Estimate the power needed by noting the distance to the hole. Press the button and hold it until the power level is sufficient to reach the hole and then release it. The golfer will putt automatically. Refer to the figures following. READING THE SCORE: The score indicator is displayed on the right of the screen. The indicator shows which player is hitting, which players are in the hole, how many strokes each has taken this hole, and how each player's total score compares to par for the course. Par represents the number of strokes a good player [mising word] used by the time he or she got to this hole. If your score is '-5' for example, that means that you are 5 strokes under par or 5 strokes less than the good player (which is good). Am 'E' means you are even par or just equal to the good player. A '+5' means you're 5 strokes over par. The par comparisons do not reflext the scores for the current hole. RULES FOR SCORING: (1) You receive a point (stroke) each time you hit the ball, regardless of the distance it travels, from the time you tee of until you sink the ball in the hole. (2) You receive a distance penalty if you hit a ball out of bounds, into a water hazard, or into the mud. RULES OF THE GAME: (1) PLAY AS IT LAYS. You must play the ball from the position in which it lands. Exceptions are: out of bounds and those that land in the water or mud. (See below). (2) OUT OF BOUNDS. If your swing takes the ball out of bounds, you will hear a BUZZER. You are penalised distance and the ball is returned to its original position. It is still your turn. (3) IN THE WATER. If your ball lands in a water hazard, you will see and hear a SPLASH. You are penalised distance and the ball is automatically placed back at the point from which you took your shot in the first place. (4) IN THE MUD. If your ball hits the side of an island, it will stick in the mud and have to be replayed. Occasionally you will find other small hazards that do not appear to be grass. Do not land in them as your lie will be considered to be unplayable and you will have to hit again. (5) THE COMPUTER will take the same point of view as the player in determining the playability of a ball that has come to rest. If, after moving up closer, the ball is found to be in mud or water, the computer will place a small pad under the ball so the player can hit it. Just consider it a 'lucky bounce'. In this game you play alone, either against par or your own best score. You do NOT play against the computer. (1) After each player has teed off on Hole 1, the player who is farthest away shoots second, etc. If, after your shot, you are still away (farthest from the hole), it is still your turn. You continue until you are no longer away. (2) When a player has hit his ball and his turn is over, his ball will not appear on screen again until it is his turn. (3) Decide the order in which you players tee off when names are typed in at the beginning of the game. This order will determine which score readout is yours throughout the game. If you tee off second on Hole 1, the second readout will always indicate your score. (4) After a hole has been played, the player with the lowest score on that hole tees off first on the next hole. This is called "having the honour". Since the score is kept on each hole, you will be able to determine from it who has the honour. The computer also keeps track and automatically changes the colour of the score readout for the player who has the honour. Compete against your best score and the golf course by trying to come in under par. Depending on the course, a very skilled player can score 10-20 strokes under oar on eighteen holes. MEDAL PLAY (Singles or Partners). Winner is determined by total of all strokes (points) for the entire game. Low score wins. MATCH PLAY (Singles or Partners). Each individual hole is awarded to the player or team with the lowest score on that hole. At game's end the player or team with the most holes won takes the game. BEST BALL (Partners only). Method of scoring for either Medal or Match Play. Best score by either partner on a team is used as the team's score. NOTE: If you decide on Match Play or Best Ball game, you will need to keep track of your scores on a seperate sheet of paper. The computer does not keep score in this manner. GAME TIPS: (1) Be sure to CHECK YOUR CLUB - Check to make sure the golf club you want to use is displayed. When you are making final direction adjustment, the golf club can sometimes change accidentally. (2) Always go to the Driving Range before starting. This allows you to get the correct timing on your swing. (3) Remember that the wind can make a substantial difference to your shot, especially short irons and your pitching wedge. (4) Try to avoid hitting your ball onto the edge of the green far away from the hole. The greens are large with downhill and uphill braks and if you are too far from the hole, you may require 2 putts to get to the hole. Remember: You MUST use your putter on the green. (5) Be extra careful in judging distance over water. If your ball falls short and lands in the water, it'll cost you a distance penalty. (6) Learn to use the hook and slice. They can be used to your advantage on difficult shots and when the wind is in play. ADDITIONAL FEATURES: DRIVING RANGE - To get the Driving Range press [R] when the 'Select Player' screen appears. Exit by pressing [/]. ABORT FEATURE - You can return to the 'Select Player' screen from almost any point in the game by pressing [/]. This will cancel the game in progress. REPLAY FEATURE - If you wish to start over at the 1st hole without changing names, etc., press [P] from the 'Select Player' screen. AUTOMATIC DEMO - If left unattended for one minute the computer will start the demo. You may start the automatic demo by pressing [D] from the 'Select Player' screen. TROUBLE SHOOTING: IF YOUR SHOTS HAVE NO POWER - Either you are releasing the button too soon, too late, or not at all during the backswing. Press the button to start the swing and hold it down until the club is at the top (highest point) of the backswing and then release. IF YOUR SHOTS CURVE BADLY LEFT OR RIGHT - You are not pressing the button just as the club hits the ball. Re-read the section on "Swing the Club and Hit the Ball" and practice your timing on the NOVICE level.